Tap to do 2 points of damage to any target. Each time you use this ability, you must choose one of your artifacts in play and place it in the graveyard. This artifact cannot be one already on its way to the graveyard, and artifact creatures killed this way may not be regenerated. 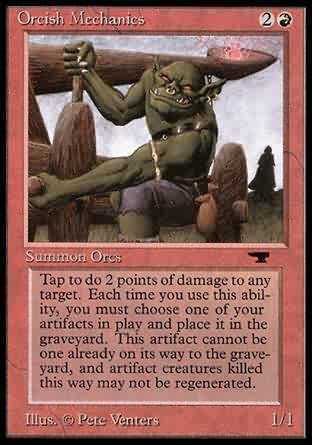 T, Sacrifice an artifact: Orcish Mechanics deals 2 damage to target creature or player.